Rhodiola (Rhodiola rosea) is a traditional Icelandic, Norwegian, Swedish, and Russian adaptogen herb used to enhance cognitive and physical vitality. Products fared well in terms of having correct Rhodiola Rosea dosage while containing proper measurements of rosavins and salidroside extracts (1% and 3% respectively). Products that did not have proper ingredient dosages were penalized in the effectiveness rankings. 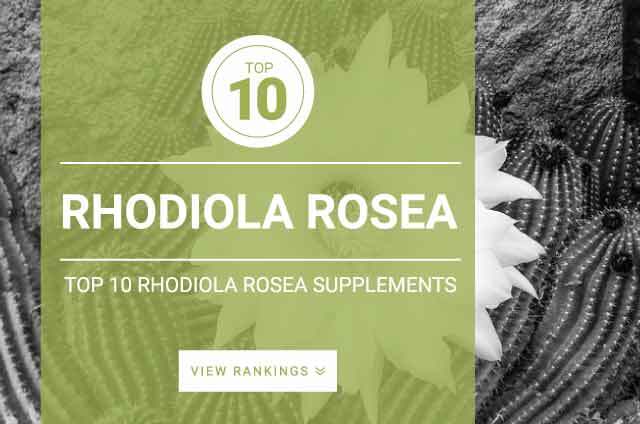 Supplements containing organically sourced Rhodiola rosea were given higher rankings to those sourced from unknown areas. Products that contained controversial preservatives, binders, and filler ingredients received reduced ingredient quality ratings. Rhodiola rosea is an adaptogenic herb supplemented to help reduce fatigue, boost energy, and increase resilience against stress induced health aliments. Rhodiola is considered to be the “new ginseng,” for its ability to help users fight fatigue, enhance cognitive function (memory, mental quickness, focus), increase sports performance, and improve overall general health. Research shows that Rhodiola is most effective at keeping individuals mentally clear and focused during stressful situations where side-effects of stress would cause fatigue and brain fog. In regards to fatigue, rhodiola extract seems to be effective at fighting the effects of fatigue caused by sleep deprivation and stress. A study showed that individuals who supplemented rhodiola extract prior to school examinations were able to maintain mental focus and alertness more so than the control group who suffered from stress induced side-effects. In regards to sports performance, rhodiola appears to be effective at combating stress caused by prolonged physical exercise. Research states that this doesn’t give you additional performance enhancements but reduces the effects stress can cause on the body and mind. Overall, Rhodiola appears to be effective at combating fatigue caused by stress. Rhodiola may help users keep mental clarity and focus which may improve decision making when willpower is low. Rhodiola Rosea may help dieters make better decisions while dieting during late night hours or during peak stressful situations where food choices are usually poor. Standard Rhodiola Rosea extract dosage: 170 – 600 mg daily with supplements containing both 3% rosavins and 1% salidroside.